Dean Vegas - rated the world's No. 1 Elvis Presley Tribute Artist, Impersonator and Marriage Celebrant. One of the world's top tribute shows, look-a-likes and impersonators of Elvis Presley. A superb entertainer for cabaret, clubs, conference after dinner entertainment, personal appearances at your company awards nights, trade shows, private or corporate functions and events. On 4th August 2000, Dean Vegas returned home from Canada to a hero's welcome with media and fans everywhere. They had all come to see the World's No. 1 Elvis Tribute Artist awarded at the Annual Collingswood Elvis Festival, the biggest of its kind outside the USA. He was also awarded the prestigious "E Award" which is nominated by all other Tribute artists to the person who best depicts Elvis. A great achievement for an Australian. Dean Vegas was also presented the Queensland Clubs' Award for Best Show of the Year 2000. Dean also took out Best Australian Tribute Artist for 2002 at the Wintersun Rock'N'Roll Tribute awards. Dean has performed internationally, wowing audiences with his Tribute to Elvis spectacular. Throughout this energized 'Vegas style' show, audiences not only share the hits from Elvis' amazing career, but experience the passion and warming personality of a truly great performer. Dean continues to break house attendance records night after night as his popularity grows at an astonishing rate. Over the past 3 years, Dean has performed in Las Vegas, Canada, Lebanon, Memphis, Bali, Indonesia and Tonga. He has appeared in television commercials across Australia, including the Rock Building Society in Rockhampton, Brisbane Extra, Bronco’s Football Club & Telstra.com to name just a few. Most recently he starred in the Franklin’s Big Fresh commercial aired throughout the eastern states. He has been an invited guest on numerous primetime Television & Radio shows all over Australia & abroad. During Dean’s tour through the US in August last year, he was invited to audition and succeeded in being the first Aussie to co-host of the new Pop across America show, launched on television throughout the US in mid September 2001. 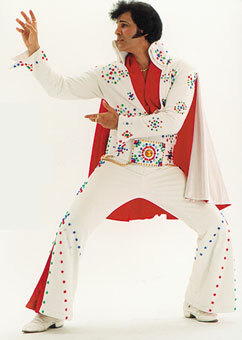 Dean Vegas is Australia's only official Elvis marriage celebrant. Be married with Elvis as your marriage celebrant! The Wedding Vows are based around the Elvis songs and makes for an unforgettable (and totally legal) event... its a wedding that family & friends will be talking about for years to come. Sadly we no longer have the opportunity to see the real Elvis. Dean Vegas is the closest you will ever get! Thanks for the memories on Saturday Night at QPAC what a wonderful Tribute you paid to Elvis. It was a night everyone that attended will never forget. Tears were flowing. Keep up the great work we need you & rely on the best. Go for it Champ. The Pink & Black Social Club Inc. I can honestly say that I was not only impressed with your show, but, it was nice to see an Elvis impersonator, who didn't try to act like he was Elvis himself out there... watching you perform brought back a lot of great memories of the man himself. A job well done and the best I've seen. Dean performed at the Elvis Festival in Morpeth January 2002. it was the 1st time that the people in the Hunter Valley Area has ever seen Dean perform. He was mind blowing in his performance. Nothing was a problem for Dean. His personality and his gift of being around the fans was unbelievable. 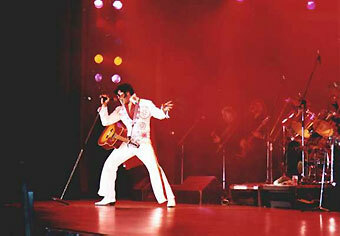 He was a hit, and on January 11-2003 he is returning to Maitland Town Hall where the show is a complete SELLOUT.